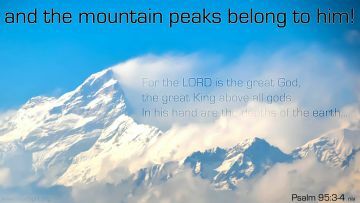 The Mountain Peaks Belong to Him! Description Heartlight Christian Powerpoint background of Psalm 95:3-4 niv -- For the LORD is the great God, the great King above all gods. In his hand are the depths of the earth, and the mountain peaks belong to him.